EnerSys VaultFlex Enclosures are the solution to today’s requirements for increased power and cooling required per cubic foot of enclosure for dense communication equipment. Developed by EnerSys and its subsidiary Purcell® Systems specifically for outdoor applications, these enclosures reflect the synergy between the world leader in stored energy solutions and the leading manufacturer of battery enclosures. VaultFlex enclosures provide a secure thermally managed environment for backup battery systems that ensures the most efficient thermal management solution with the lowest energy consumption. The alliance between EnerSys and Purcell Systems provides a one-stop resource for both batteries and enclosures. Availability through the global EnerSys distribution channel streamlines the process of building and managing a world-class stored energy system. 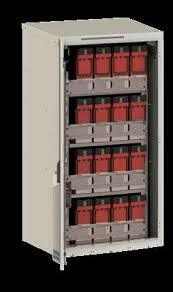 For additional information about Enersys VaultFlex Enclosures, call 800-876-9373 or email sales(at)power-solutions.com.